We are a BHS approved and Renfrewshire council licenced stables and riding school near Lochwinnoch, Glasgow. We provide a sanctuary for horses and learners alike with our riding school and livery in the rolling hills looking over the great Lochwinnoch and the stunning Clyde Muirshiel National Park. 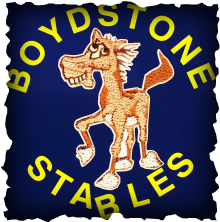 Here at Boydstone we pride ourselves on our personal touch and natural stables environment. Our aim is to service our clients and horses and to bring a sense of community amongst our resident livery and visiting riding school clients. Our Farrier Kevin Moriarty visits every Friday to shoe our school horses.